The All American Rejects have always had something in common with each of there first few albums, a knack for writing hit singles. 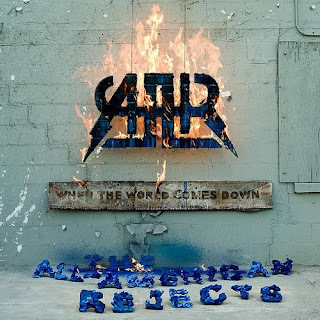 As I begin to listen to their newest release titled “When The World Comes Down,” (released today, Dec. 16th 2008) I am reminded that never has an AAR album stood out to me beyond the singles. To me this is one of those bands that never quite put together a good album, but instead spent time crafting some of my favorite singles of all time. The opening song on the album ‘I Wanna,’ is a great starter song but just five songs in I’m already a little bit over the album. As I said before AAR is at their best when performing hit singles and there is no exception here. ‘Gives You Hell,’ is the first single off of this album that is sure to produce up to four more hit singles. ‘Gives You Hell,’ is one of my favorite singles by the group. Looking at this band from a larger perspective they have never had the ability to sell out show after show and seem to be having trouble reaching the next level. Although they have a large tour planned for later this summer, the group will need this tour to be successful in order to generate buzz for the album. One thing that separates this group from others are their albums. Groups such as Boys Like Girls and Fall Out Boy have been successful because of their ability to put together solid albums. The fans of AAR are fans simply because of the singles and not as much because of the albums. So how does this translate for live shows? Well it means that the audience will only recognize about half of the set. The upcoming tour will reveal a lot but this album is definitely worth checking out. It’s not for everyone but honestly, the singles are so good that they’re worth listening to the album. Their first studio album was bomb. I was so into like all the tracks. Then when they released Dirty Little Secret they lost me. I really like Gives You Hell, though.